Weymouth sailor Giles Scott says he has regrets about not reaching the 2012 Olympics but is determined to put that behind him by winning gold at Rio 2016. Despite being World and European Champion in 2011 and beating Sir Ben Ainslie at the Sail for Gold Regatta in 2012, Scott missed out on selection. 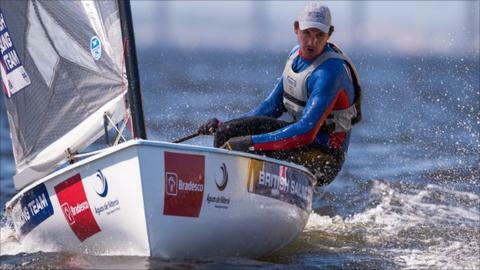 Ainslie was chosen for the Finn Class and went on to win gold. "All I can do is focus on the future and learn from my mistakes in the past," Scott told BBC Radio Solent. Scott delivered Great Britain's only gold medal at the world championships in Spain last week and has now won back-to-back world titles. And the 27-year-old said that the next two years in the build up to the Rio Olympics will fly by. "When you plan it out and put it all out on a calendar, two years does feel very small and just around the corner," he said. "You can dwell on it (missing out on selection) and it can come across as being frustrating which it was two years ago. "I do have regrets but I have to learn from it and move on." The course is Rio has faced criticism for the quality of its water but Scott, who has raced in a test event there, alleviated any fears. "I came away feeling pretty positive," he said. "The water quality wasn't great but didn't stop us racing. There was some decent wind."